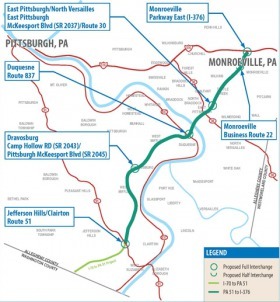 The Mon/Fayette PA Route 51 to I-376 Project is the final of four Mon/Fayette projects that would provide a four-lane, limited access expressway from I-68 in West Virginia to I-376 in the Pittsburgh area. This final project would extend from PA Route 51 to I-376. The PA Route 51 to I-376 Project obtained a Record of Decision from the FHWA in December 2004 identifying the Selected Alternative to be designed and constructed. That alternative moved into the Final Design process but was put on hold in 2009 due to a lack of sufficient funding for construction. With the passage of Act 89 in 2013, funding is once again available to move this project forward. The PTC has made some modifications to the 2004 Selected Alternative and is reevaluating the impacts of this project on the environment. As such, the PTC is seeking input from the public regarding this modified Selected Alternative for that reevaluation. 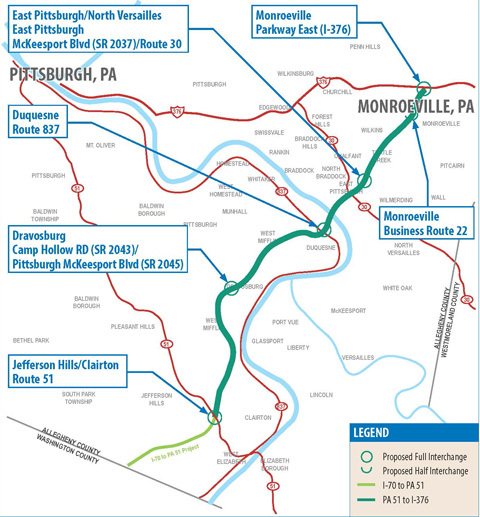 The Turnpike is reinitiating this project and seeking feedback on project modifications to the 2004 Selected Alternative for the environmental reevaluation. Come out and express your concerns and/or support for the project. For the convenience of attendees, the meetings are being held in four locations from 6:00 to 8:00 PM. Click here for more details.